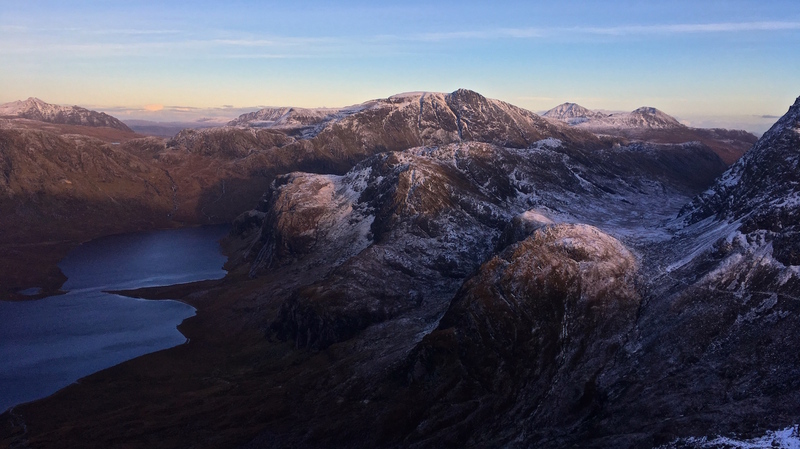 Deep in the heart of Wester Ross lies the Fisherfield Forest, also known as Scotland’s ‘Great Wilderness’. This is a vast area without human habitation or public roads and right in the centre lies a great cirque of five Munros considered to be the remotest of them all. These are mountains of real character in a wild setting and offer one of Scotland’s best mountain journeys. This trip will be a 3 day wild-camping trip taking in all five of the Fisherfield Munros and a sixth top, Beinn a’ Chlaidheimh (formerly a Munro, but now a Corbett). The itinerary for the walk is described below. This is a shorter day, starting from Corrie Hallie, the walk-in takes a good track over the shoulder of An Teallach with views ahead to the Fisherfield peaks. After descending into Strath na Sealga we will decide upon a camp-site for the night setting us up for the next day in the hills. This will be a full day to explore this wild land and traverse the peaks. There will be an optional high camp if conditions allow to watch the sun go down over Skye and the Outer Hebrides. If conditions are not ameanable we will find a campsite lower down and complete the circuit on Day 3. The homeward journey. There will be a couple of river crossings, before passing the legendary Shenevall bothy and picking up the path back to the start point, and thus completing the circuit. A good level of fitness will be required to undertake the long distances covered in this expedition and extra kit and food will need to be carried for the overnight stops. Don’t worry though, the walk will be at a pace to compensate for the extra load (the aim of the game is enjoyment after all!) and we are here to answer your questions should you like any advice on what you will need to bring.